And it is a wrap up! The last two days have been probably the quickest to go by. Descending from Ama Dablam Base Camp was an easy task, enhanced by every step we took, as every foot of elevation we lost, made our bodies invigorate. Joining the main Everest trail was a colorful experience of different nationalities, which we almost forgot in the relatively isolated expedition we had. Arriving in Lukla definitely provides a sense of accomplishment, closing the trail loop we started nearly one month ago. Now we are at the mercy of the weather to leave the mountains behind in our airplane tomorrow. Wow! This is on my bucket list. Hello from Ama Dablam Base Camp! Are you unsuccessful when you don’t reach the summit of one of your objectives? Well, I think that if you have carefully prepared for it and put yourself in the best position for it, despite little odds in our favor according to the forecast, and you make the decision to head down because the one thing you can’t control is totally out of control, then yes, you’re successful. It was windy when we arrived at our High Camp, it was windy throughout our short stay, and it was like a freight train when it was time to go. There’s no way we could fight on the steep, cold and dangerous slopes of Ama’s southeast ridge what “Eolus” had in store for us. So the only thing we could do, knowing that we had waited until the very last day, was to be smart and head down. Undefeated, because in the mountains what counts is telling the story. But sure disappointed to not to have been able to climb just a bit more. 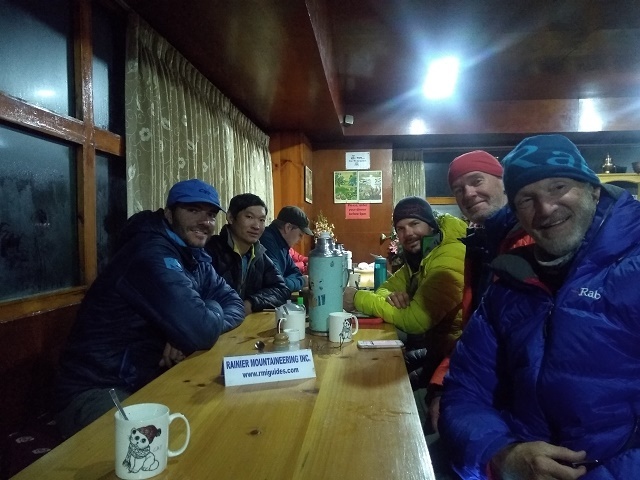 But oh well, we’re now back to the safety of our lodge at Base Camp, and we’ll stay our descent tomorrow, eager for thicker air and why not, to start closing up our Himalayan adventure. We climbed to the famous Yellow Tower, surmounting the most technical terrain that this route presents. We dragged our feet leaving Camp 1 as to get bathed by the sun a little bit. Then we crossed with ease the beautiful yet incredibly exposed crest with several hundreds of feet to drop on either side, contemplating how the now distant Base Camp became smaller and smaller down in the valley. The winds are strong here, but the sun shines and it is comfortable inside the tents. Air feels thin, but our acclimatization process has been productive. We’re going to hope for the best with the winds and we will put up a good fight, smart though, but we won’t know until we get higher later tomorrow morning. We sure hope to make a phone call from the summit! Go Dad! Can’t wait to hear about it! Enjoy the sunset and the sunrise ! Hello! We are at C1. A long day brought us here under clear skies. We’re alone here and we presume it will be the same at C2 when we arrive later today. Not much to report other than we had an incredible sunset last night, perched here on Ama Dablam’s ridge. Let’s keep hoping for the winds to die in the next day or two! And we are going up! 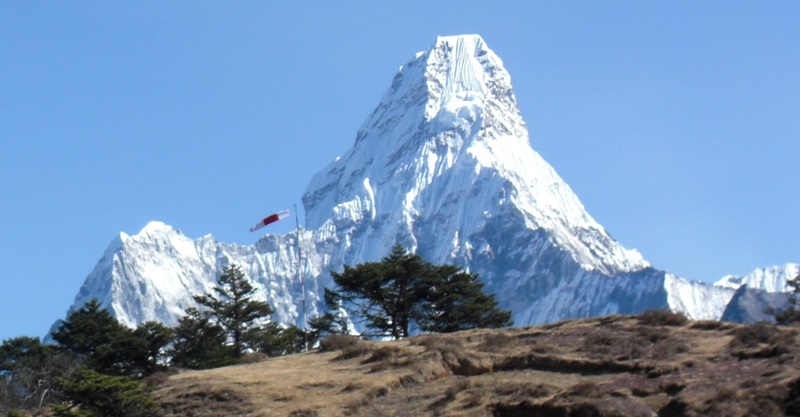 After another rest day at Ama Dablam Base Camp, all is packed and ready and we are starting our summit bid. Stay tuned for our progress up high! May the mountain gods be with you - we are rooting for you from the couch wishing that we are on the mountain ! After a rest day yesterday at Ama Dablam Base Camp, where we practiced some of the rope techniques we’ll implement on our ascent, today we’re in a holding pattern for the weather. Our camps are stocked thanks to the help of our Sherpa, and we’re ready to go when the time is right. In the meantime, we continue to execute expedition life; patience at it’s best. Well you all look healthy and happy! We made it to Ama Dablam Base Camp! Right on time for lunch, the team pulled into the little hut (we’re avoiding tents at the base of the mountain) and we have been just resting, hydrating and eating. We are close by having just finished Mera Peak!! Good luck to you and team. And from one Spaniard to another remember…....You have to make sure you look good! We have started our progress towards Ama Dablam, and we left Khumjung this morning under an unusual layer of fog that made our walk a bit chilly and damp. Our arrival to Debuche, half way between Khumjung and Ama Dablam Base Camp, was greeted with the best soups so far this trip, and we are enjoying the afternoon staying warm inside our lodge, named Rivendell. Nothing more to report from the trails today, other than we have started to feel the home stretch of our journey towards Ama Dablam; early bed tonight and tomorrow base camp! We did retraced our steps from the mountain and we are back in this guide’s favorite Sherpa village of the Khumbu. We’re going to earn some good rest before starting our approach to Ama Dablam. 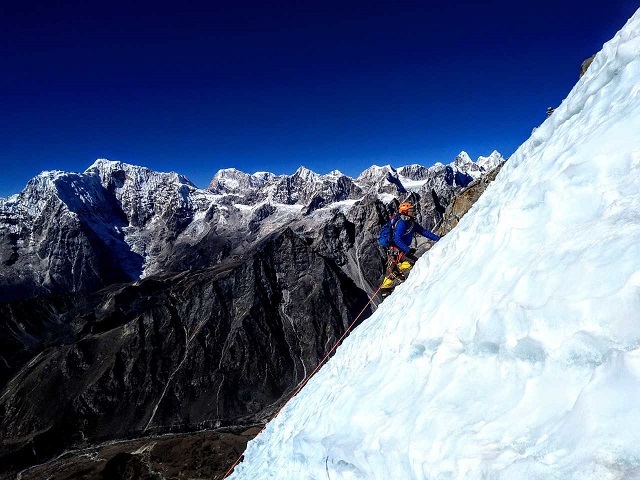 The climb of Kyajo Ri remains now as an incredible challenge that we overcame with determination, and we know that while an objective worth a trip to the Himalaya on its own, it has been the best preparation for Ama Dablam. Now it’s time to sleep, eat & repeat! Greetings from Kyajo Ri Camp 1. What a day we had!!! We departed with headlamps and returned with headlamps… Having to forego our move to Camp 2 yesterday due to the high winds, delivered not only a beautiful day today, but a marathon one. 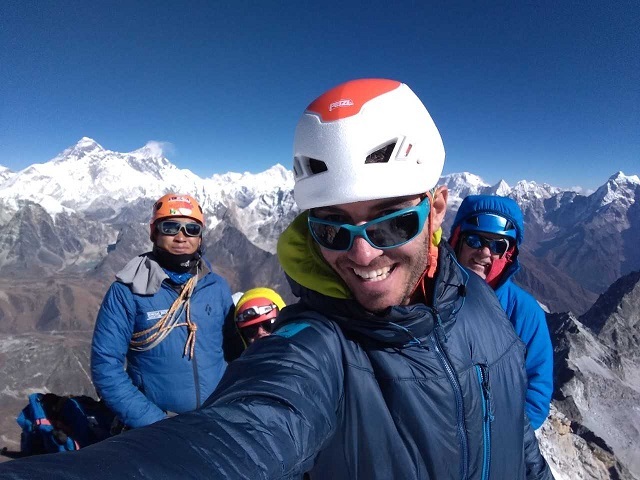 Regardless, we wanted to reach the elevation of Kyajo’s summit to better prepare for Ama Dablam. So we did! Now everyone is very tired, and we look forward to some rest coming up.